The experience of 1914 taught the French Army that to be conspicuous on the battlefield meant certain death; especially on the modern battlefield with massed machine-guns and artillery. In 1914 alone France had lost over 300,000 Poilus killed in action and despite going to war locked in the mentality of the Franco-Prussian the French Army proved remarkably quick to adapt to the war when it went into stalemate during the winter of 1914/15. The French Army was the first to introduce a steel helmet; a first this was a light steel skull cap worn under the issue Kepi. Then an officer called August-Louis Adrian adapted the design of the Paris fire helmet to produce the M15 Adrain helmet, worn by the men in this illustration, which became the standard French helmet for the rest of the war. The French also discarded the dark blue serge and red trousers and adopted the Horizon Blue uniform, also seen here; it was felt the blue would blend in with the skyline when French soldiers attacked, rather than attempt to develop a uniform colour that would blend in with the shattered landscape. 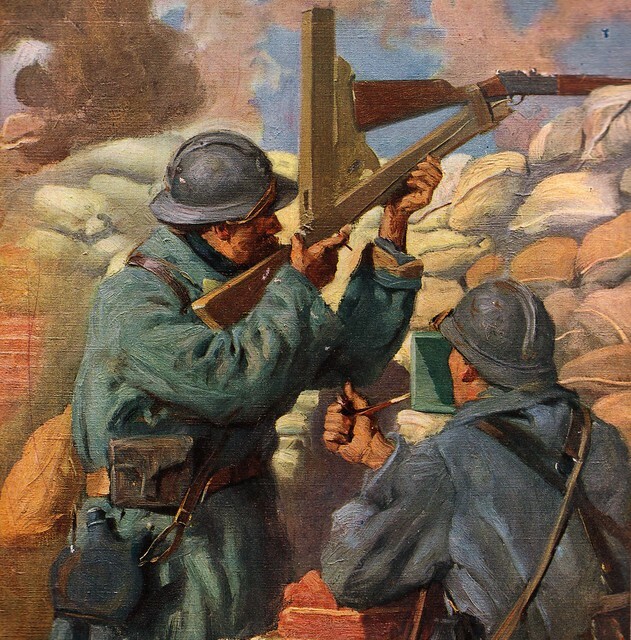 New uniforms also meant new weapons and stuck in trenches unable to emerge and fire their weapons, both sides turned to using the periscope rifle, also seen in this illustration; in this case enabling the Poilu to fire his 8mm Lebel rifle remotely and safely using the periscope fitted to the frame. It was just the start of adapting old weapons to work in a new way, or re-introducing old weapons from earlier siege wars. This entry was posted on 02/05/2012 by sommecourt. It was filed under France, French Army, French Front, Verdun, Western Front, WW1 and was tagged with 1916, French Army, French Front, Horizon Blue, Poilu, Verdun.